Hard to believe it’s been a month shy of 13 years since Randy Moss, um, saluted Packers fans (above) by pretending to do what many of them actually do roadside when the visiting buses make their way north from Appleton to Lambeau Field. 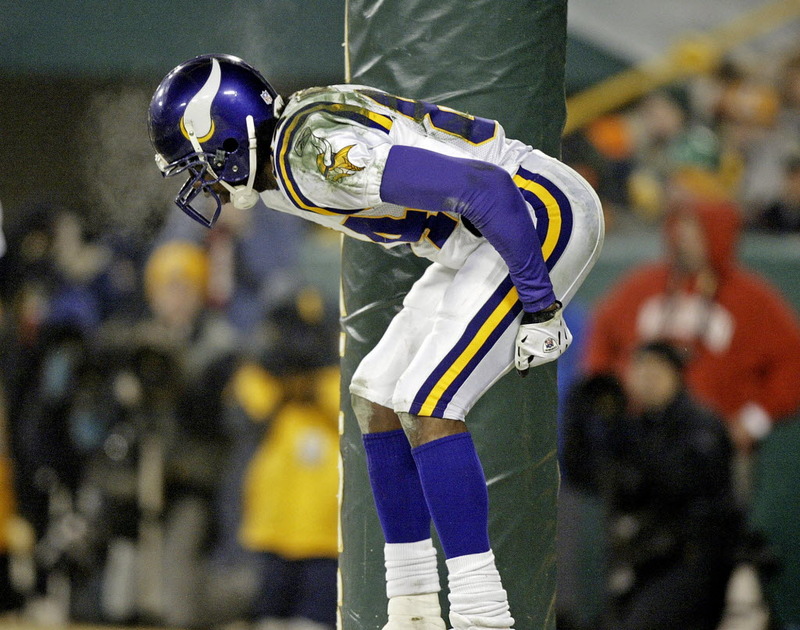 That moment in Vikings history came during a wild-card playoff win over the Packers. Saturday night, the stakes will be high again, but only for the visitors. Yes, Packers fans will be rabid. They’ll be a tad angry with Anthony Barr for breaking their season and Aaron Rodgers’ right collarbone in one fell swoop back on Oct. 15. But Rodgers won’t play and, well, the last time he didn’t play, the Packers needed overtime to beat the Browns a couple weeks ago. So the Vikings should stay in control of the game as long as they don’t turn the ball over or draw flags like they did last week when they tied their season high with 11 penalties. This one seems like an easy pick. I do think the Packers will be more motivated than your typical team that’s already been eliminated. I just don’t think it will matter without Rodgers. The picks here went 11-5 straight-up and 6-10 against the spread last week. And, of course, the Upset Special was anything but (3-12). I figured Rodgers would haunt the Vikings for one more week, but even he proved human in that loss at Carolina. Three underdogs won last week, including the Rams, who crushed the Seahawks 42-7 at Seattle. Bye-bye Legion of Boom. This week, three teams are favored by 10 1/2 or more points, including the Patriots over a Bills team that’s still in the hunt for its first playoff appearance since January of 2000. As always, take the Patriots. Six road teams are favored this week: Vikings, Lions at Cincinnati, Chargers at Jets, Rams at Tennessee, Jaguars at 49ers and Steelers at Houston. I like all six favorites. For the Vikings to go into Week 17 with a chance to earn the No. 1 seed, they need to beat the Packers and have the 9 1/2-point underdog Raiders beat the Eagles in Philadelphia on Monday night. I like the Raiders to surprise the Eagles. But don’t get too excited. It’s my Upset Special. The Vikings are healthy, focused, motivated by getting a first-round bye and just plain better when the Packers don’t have Rodgers. Nick Foles looked good last week with a 115.8 passer rating, four touchdowns and no interceptions. But Philly is wobbling. It fell down 20-7 early in the second quarter before rallying to beat the 2-win Giants 34-29. The Raiders have been a big disappointment, but they have the ability to pull this off.